Fast forward to present day, to Blackwater Farm in West Tisbury– It’s August on Martha’s Vineyard, and it’s hot …really hot. We aren’t speaking of the weather, but rather the temperature inside the small studio of island-based glassblower, Russell Carson who, seemingly impervious to the heat emanating from the furnace, can be found shaping and molding what will soon become a delicate, functional, and displayable work of art. Russell continued, a bubble is blown into the glass and the glass is inflated to the desired shape. The bottom is flattened, and the piece is transferred to a solid steel rod with a small bit of glass at the end, called a punty. Then, the top of the glass can be reheated, opened and finished. Watching Russell create his signature delicate pieces of glass and listening to him explain the process of how he does what he does, is awe-inspiring. Thoroughly engaging with a soothing voice and easygoing aura, 38-year-old Russell got his start in the craft quite accidentally. Introduced to a glass blower in 2003, he decided to give it a try. “I did not like anything about it the first time I gave it a go,” Russell shared. “In fact, I burned my left hand terribly. It was a year before a tried it again. 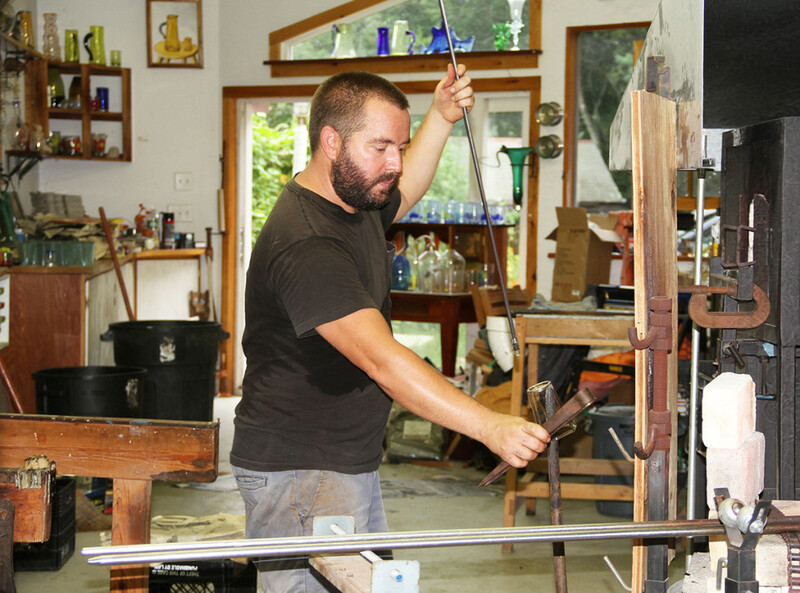 In 2005, I moved to the Vineyard from Roxbury, Connecticut with my partner, Maura Martin, and accepted a job at Martha’s Vineyard Glass.” A skilled and accomplished glassblower today, Carson humbly adds that, some 13 years later, he has not perfected the art. To get into this groove, the right music is essential, and for Russell this usually includes disco and house (electronic). These music genres employ the beat of the “four on the floor,” where the bass drum hits every fourth note. Imbuing and combining his inspirations from nature, the human form, and fine art, Russell’s pieces are far from generic or mass produced, both in appearance and quality. 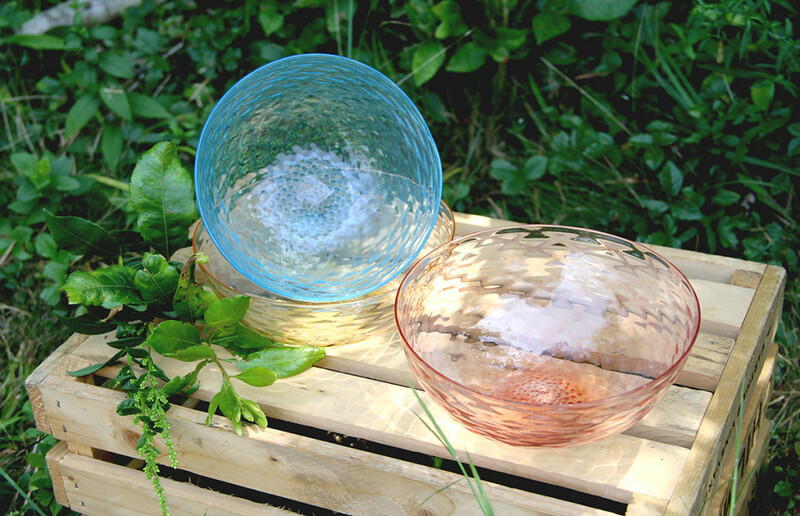 They are clean, clear, thoughtful and delicate, with his style identifiable when among glass works by his fellow artists. 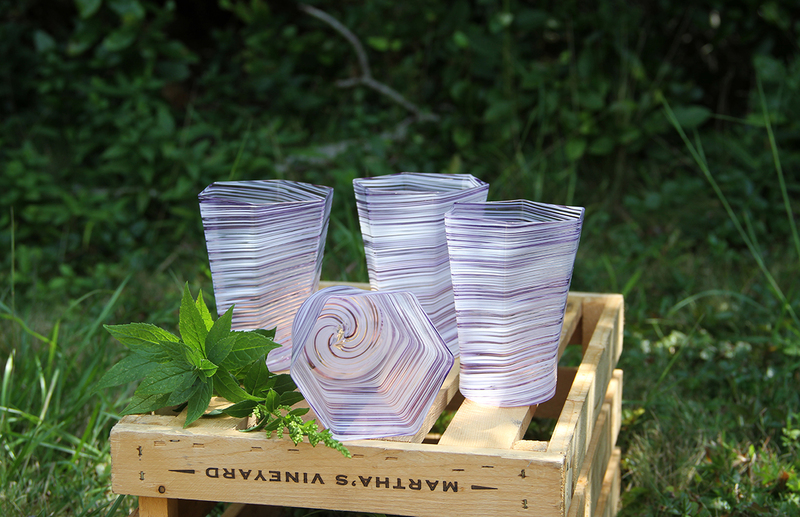 His glass collections are simply beautiful, including his hexagonal tumblers blown and colored in the prettiest shades of pastels. When not in the studio, Russell helps teach a Venetian glass blowing class in Italy with his friend Oliver, who is also a teaching assistant. 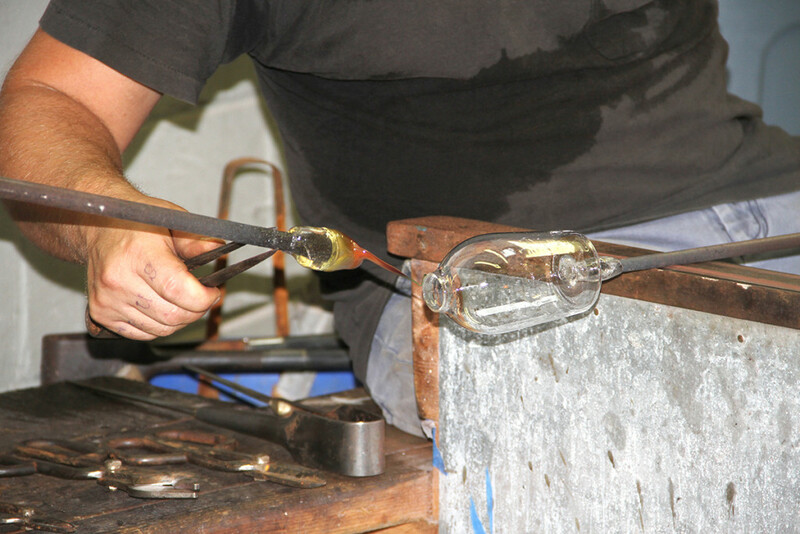 “I have been helping one of the maestros, Davide Fuin, from Murano for the last seven years or so whenever he has been teaching workshops,” Russell shared. “Davide is regarded as one of the best in his field, which is stemware and historical reproductions. He is a true master in the most delicate and intricate works in glass. Davide used to come to the United States and hold workshops in Corning, NY and Boston, but for the past three summers he has held the classes at his own studio on Murano. Murano glass is difficult to explain, but the way the glass is worked here in America is very different than in Italy. Lots of equipment and techniques are involved. When looking toward the future, Russell aims to have his own space and equipment. But, for now, his goal is to make sure your glass is always half full, and made by Russell Carson. Russell and Maura currently live in Vineyard Haven with their 7-year-old son Leo. Items made by Russell Carson Handcrafted Glass can be purchased at Morrice Florist in Vineyard Haven and The Carnegie in Edgartown. 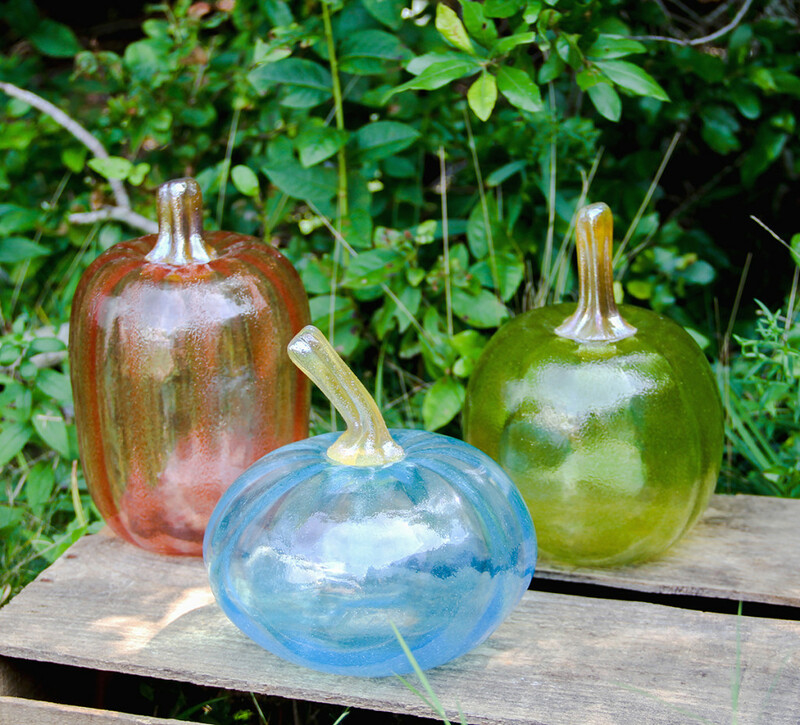 For online purchases visit www.russellcarsonglass.com. Select custom orders are accepted.